Long ago I built a version of Gary Katz’s tool box, but I wasn’t too happy with the way it turned out—too heavy and the wheels were too small. After that I decided to build the one I’m using now, and to be honest, this last tool box has won more praise from my clients than my door hanging. I would say that almost every client that sees it makes a comment about it. One older women went as far as to say that by looking at the tool box she could tell that I was a craftsman. I don’t take compliments too easily, so I just tell people that my tool box is a progression of Gary’s tool box, and in fact it is. I’ve been using this tool box for about 2 to 3 years and I have been very happy with it. I made the box from 5/8-in. fingerjointed pine screwed and glued together, and for appearance I sealed the wood with a clear coating after. I cut out a hand hole on the center of the top center to pull the box around, and added two holes on the sides to lift the box when going over a threshold or anything else that I feel it should not take the weight of the tool box as I pass over it. As a door hanger I always needed a short step ladder, so I added steps when I built this new box. As a step ladder, it is very steady. I stand on the lower step to check the reveal on top of the door and I step on the higher one when I need to plane the top of the door if the reveal is a little tight. I use the steps as small work tables. The steps fold up and out of the way. The bottom step opens to get to the tool tray. It folds all the way over and becomes a place to hang my hammer. The top step has a small fluorescent light mounted below. The light comes in handy and the step lifts up if I need even more light, which has been of great help in a few occasions while installing locksets on interior doors late in the evening in poorly lighted homes. The top surface of the top step is recessed to hold hinges and screws while I am installing hinges on the jamb or lockset hardware when installing locks. Mobility is a must for a working tool box. The old box had heavy duty castors, but on the new box, I used 6-in. diameter wheels–good enough to climb curbs, steps and every obstacle I encounter. I could have gone bigger, but it was not necessary, 6-in. is good enough. I mounted the wheels on regular 1/2-in. galvanized electrical tubing for an axle. To move it around, I just tip the box back and wheel it like a hand truck. Even fully loaded, it is very easy to load and unload from my truck. It is a one man tool box–on the heavy side like most tool boxes–but I have lifted it and carried up and down the stairs many times without problems. Even with all the cordless tools that I own, I still need electricity for plug in tools. So I turned my tool box into a giant extension cord. I mounted a single receptacle on the back of the box that is fed by a 16-ft. power cord. The power cord coils up and stores in a space in the back of the box. The rest of the bottom area is for tools or objects that I don’t need quite often or that are too big to be in the upper shelf where all the other tools are. I put magnets under the middle shelf intended to hold chisels temporarily while using them. But I found that I never had any real need to use them–they were unnecessary after all. But all in all the box has turned out very useful and complete for all my needs. Would it be possible to get plans for this toolbox? Sorry, unfortunately there are no plans available for the tool box. It was something I had in my mind for a long time and it was very easy for me to build it without following any drawing or plan. click on this link http://www.garymkatz.com/ChartsDrawings/tool_tote.html. Anyone else willing to share with others the peculiarities of his tool box jump right in, post a picture and let us see it. I’m not happy with the rolling tool boxes I bought and the ones I see in the stores. Your EXCELLENT tool box has my mental gears spinning ever since I saw this earlier page this week. I’m fantasizing a lot about how I’ll make mine. I can’t believe the fluorescent light! Wow! And I like the idea of screwdrivers etc being vertical for fast access. How are the wheels attached? Is there an axle going though a horizontal pipe? Is each wheel bolted on seperately into the wood? And how does the hammer stay in place when you close it’s lid? This is a great tool box. I just started building one for myself. I have been using the carry totes from Home Depot. Very hard to organize tools in them and you never know if you are leaving with all your tools at the end of a job. This box is the right size and the steps on it will be very handy on the job site. I used plywood for the sides and this makes it a quick build. I am including a photo or two of the start of the box. I will post a picture to show how the wheels are attached. Don’t hesitate to ask any questions if you need to. Let us see it when is finished. Your box really was inspirational. I had been thinking about a new box for some time. I have looked at many ideas and even built one last year that turned out to be too big. I found that if the box is too big it does not make it into the job site. So one needs to think about the core set of tools that are commonly needed. It turns out that your box has plenty of room in it. I am adding a small drawer under the first step for drill bits, pencils and other small things. I made it only about 2/3 as deep as the box so that it can be pushed back to give easy access to the lower portion of the box. I will post some pictures later as it may give other ideas on how to configure their version of your box. I am posting some additional pictures of my version of Al’s tool box. I made a few changes that others may find helpful. I like Al’s tool box because of its size. I have been thinking of a new tool box for some time. About a year ago I built one that was too big. I tried to make it fit too many things and therefore it did not get onto the job site very often. This box is well sized and has plenty of room for the essential and often used tools. I kept the size the same as given in the Sketchup drawing. I added some hangers in the upper compartment to hold tools that I do not like having banging about. These include my small square, bevel gauge, folding ruler, coping saw and nail sets. This also allows me to see if a tool is missing. I also made a cubby space for my plane. You will also see that I have a small slot for a small notebook. I like to carry a pocket size notebook with me for measurements and shopping lists etc. The problem is that I often leave the notebook in my pockets and so I forget it the next day. I hope the clear notebook slot will remind me to leave it behind. I also added a holder for my large framing square on the side of the box. I do not use this tool often, but mounting it on the box is fairly unobtrusive and it is there if I do need it. I added a drawer under the floor of the upper compartment for drill bits, driver bits and pencils, I am forever looking for these things and wanted to make them easily accessible. Since this drawer makes the opening to the lower compartment smaller, and thus, harder to access I made the depth of the drawer narrower than the box. This allows the drawer to be pushed back into the tool box and give better access to the lower compartment. I did not mount the first step with hinges. I made it removable. Cleats glued to the bottom of the step keep it in place and if I remove the step and turn it over, the cleats act like a tray to keep small parts on while working. I am happy with how this is turning out. It is a great project that I think will make me more eficient. This box is a quick build, the dificult and time consuming part is thinking about what tools you want to carry and how you want to carry them in the box. Thanks again for the box design! The box is complete. At least for a while. I will use it to see how I end up using it and I will add features as needed. I ended up making a handle out of maple. I think the design will make it easy to pull around, pull up stairs or over thresholds. I think it will also serve as a place to hang an extension cord or hang clamps while working. A very nice feature in your tool box will be a electrical outlet so you can plug in it electrical tools. You can buy a pair of those chippies clamp type light fixtures sold at HD and clamp it on the handle and plug it into the outlet. Now you have a step ladder and a tool box that will only be heavy when you load it into your truck and when you carry it upstairs but it will go very easily over steps and curbs. Thanks for keeping us informed and let us know how it works out for you once you start rolling it around. Don’t be surprised if your hear nicer words for your tool box than for your work. I went through that many times. Thanks for keeping us posted and stay in touch. I forgot about the electrical outlets! It is something I will add. It is a good idea to use the handle to mount worklights. I had not considered that. 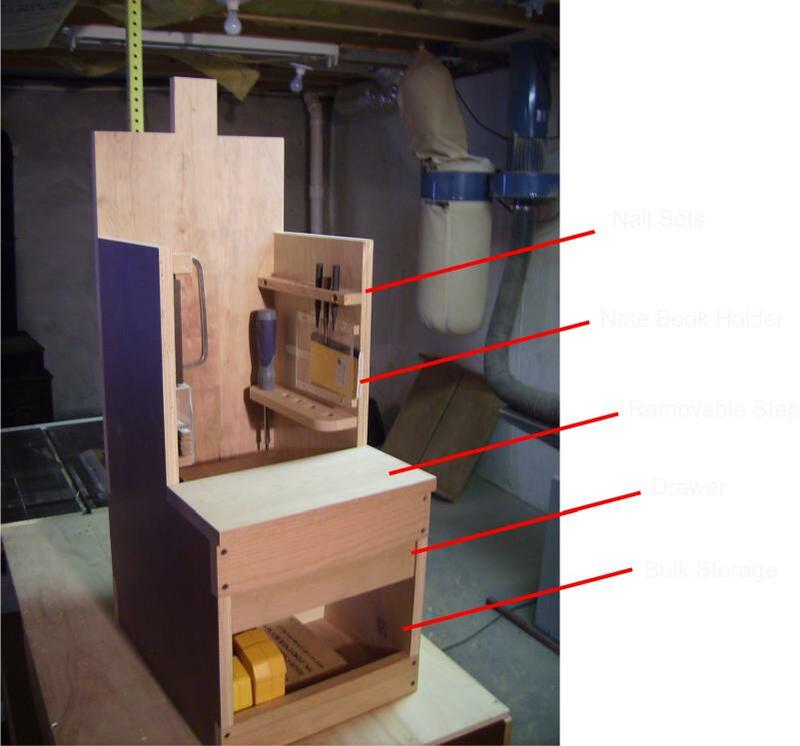 I built my carcase out of 3/4″ plywood and noticed you built yours from 5/8″ pine. I am thinking that 1/2″ ply for the carcass would be sufficient and would reduce the weight of the box. What do you think? I am just bringing this up for others to consider if they build this box. Weight control was important for me because of age (late 50’s then). With plywood you can have rough edges all around. I used 5/8 pine just to control weight and avoid sharp edges. Pardon my saying this, but it looks to me like standing with both feet on the top step is a serious accident waiting to happen. Is there something I don’t see, which prevents the wheels from rolling when standing on it? The toolbox has only 2 wheels on the back, none on the front so it can not roll away when you are standing on top of it or even by itself when left unattended. Standing on the lower step is completely safe, standing on the top step it is not as safe. Hi there. I’m a plumber working in Dublin Ireland. The endless array of off the shelf tool boxes just disappoint me all the time, I’ve lost count of how many unsuitable boxes I’ve bought and broken although there was one which didn’t break, instead it would break your arm when moving it aside from this it was not ideal in my opinion. The style of box shown here would mean a whole lot less bending to the floor. So it’s time to build my own. Has anyone built a plumbers box before? Any ideas? I do think i will make my version a little wider! Looking forward to some responses. Many thanks.